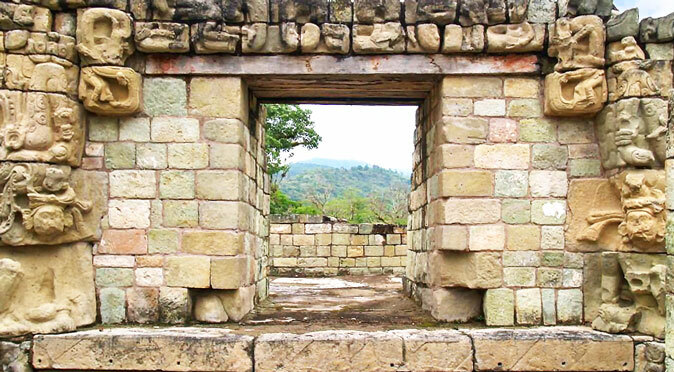 W1083: Structure 10L-18 © Robin HeyworthStructure 10L-18, also known simply as Templo 18, was the last structure added to the Acropolis at Copan and was added by its last ruler, Yax Pasaj Chan Yopaat (Yax Pac) and was completed by 820AD. The carvings that line the walls demonstrate that it was an important building, but there are conflicting ideas on what its function was. 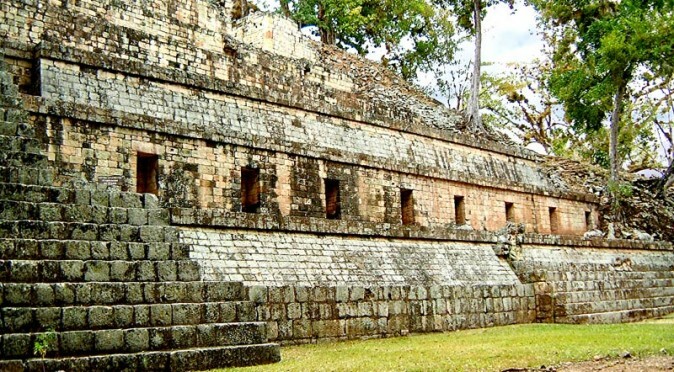 To make analysis slightly harder, part of the building was washed away by the Copan River and it was also defaced, robbed and burned shortly after it founder, Yax Pac, died. The two wall carvings (seen in fig. W1083) appear to be related in their theme: the one closest to the entrance features Yax Pac standing on a fleshed Cauac Monster holding the sceptre or torch of kingship; whereas the carving above the bench features Yax Pac standing on a skull, wearing a jawed headdress and carrying a spear. Many people suggest that the latter carving is an indication that Copan was suffering troubled times during the reign of Yax Pac and that this divine ruler had been forced to turn to war-craft. 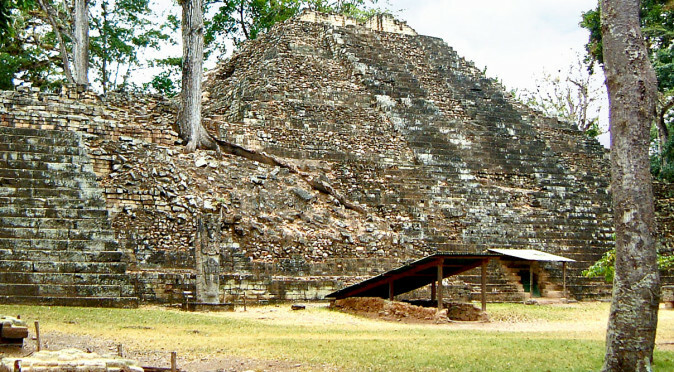 But elsewhere at Copan, deceased rulers are also shown in warrior attire – Ruler 12 on the Hieroglyphic Stairway and, most famously, Ruler 1 on Altar Q. 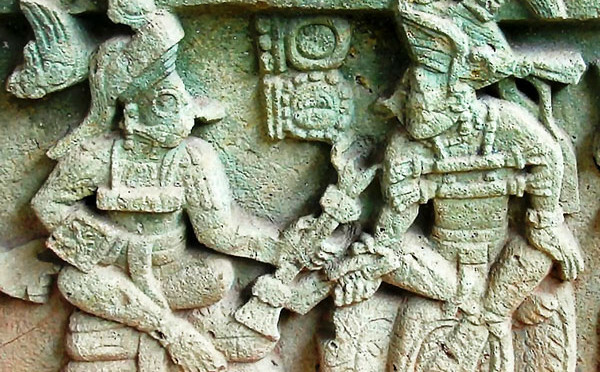 So it would seem more likely that this is how the Rulers of Copan would dress for their transit through the underworld and that we are witnessing the passing of Yax Pac. W1088: Tomb Entrance Structure 10L-18 rests above a tomb that can be accessed via a stairway. Nothing was found within the tomb and so we can only guess who was buried there. The most likely occupant is Yax Pac, but there is a good case for thinking he is buried in the ancestral home of Temple 16. Therefore, it may have been his wife who was buried here, or the tomb could have been symbolic and made purely for offerings – and niches were built into the wall for offerings to be left outside (fig. W1088). 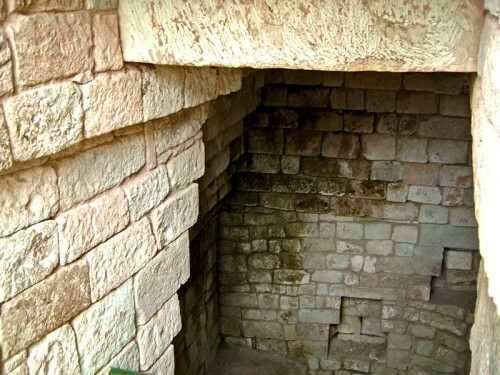 If this was his tomb, then it suggests, contrary to common perception, that Yax Pac lived in quite secure times and had no fear of his tomb being robbed. Structure 10L-18 is also home to an exquisitely carved bench or altar which divides the room in half (this can be seen in fig. W1083 at the top of the page and in detail in fig. W10847Q below). 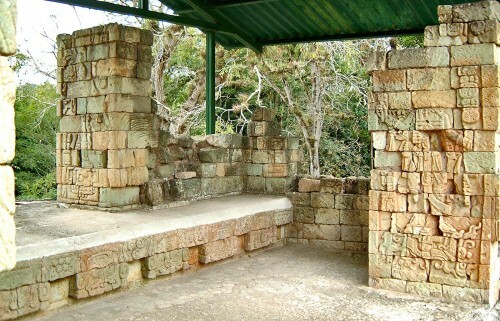 The bench features eight masks which at first seem unique, which they are, but they also alternate between representations of the Cauac Monster (Chac, Bakab, Pauahtun) who represents life, and the Jaguar Monster who represents death. The Cauac Monster (far right and 2nd left in fig. W10847Q) has an oval mirror on his forrid, rabbit-like filed front teeth, and serpents seeping from the corner of his mouth. The Jaguar Monster (far left and 2nd right in fig. 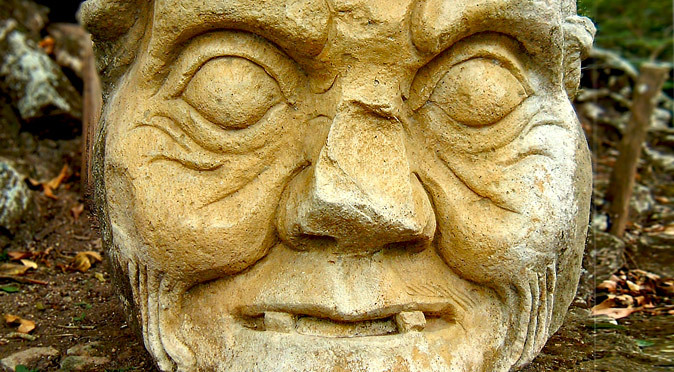 W10847Q) has a “T” shape made from 5 circles on his forrid and fangs curling from the corner of his mouth. 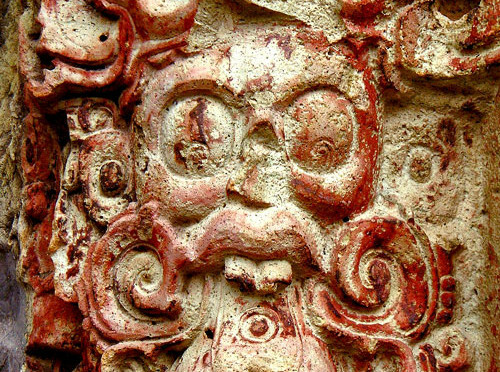 Other than these features, which are common identifying features for these gods, the faces are near identical, with the same large ear-spools and ear-pendants, the same hair and the same large eyes – although the pupils are placed differently, with Cauac’s being at the top and the Jaguar God’s being at the bottom. Between them, they have alternating images of clouds and jaguar spots. 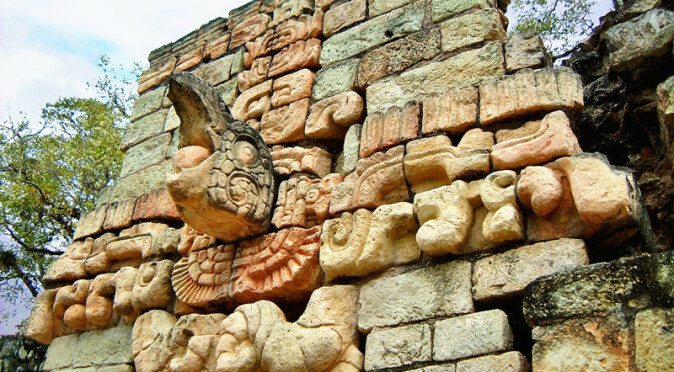 The clouds look like bunches of grapes and represent the life giving rain of Cauac (Chac). 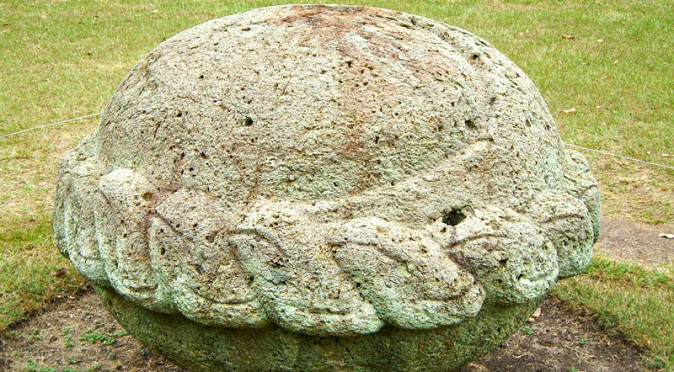 The jaguar spots look like little alien faces and presumably represent death – this triangle of circles is found frequently on the monuments of Copan. 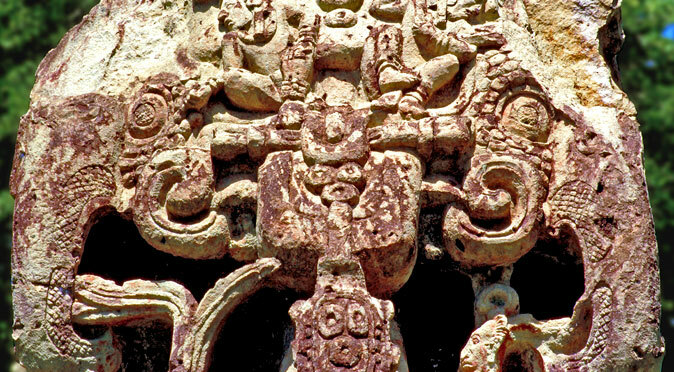 Like the opposing images of Yax Pac which adorn the walls, these images of Cauac and the Jaguar God appear to be set opposed and yet in unison, perhaps alluding to the cycle of life, death and rebirth, as the Maya understood it. 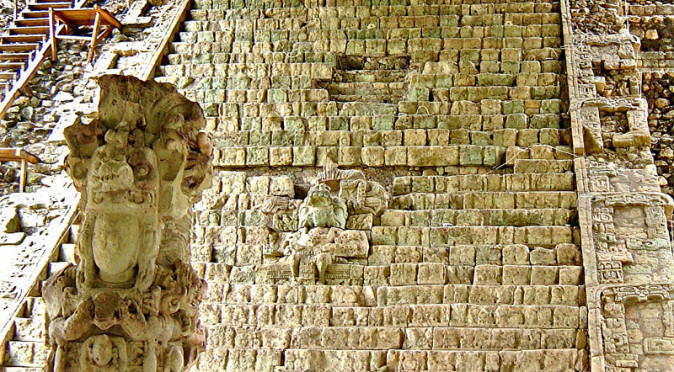 Copán is renowned for its incredible carved stone artwork, which represents the apogee of this monumental Mayan art - and it is worth visiting Copan for this alone!